Saw the incredible poster? Yeap! It's a INTER-COLLEGE dance competition among all the college and universities organized by HELP University , Revive Isotonic Drink and William & Luisa Danceworld. Btw, i am joining this and dance a story-line dance by with Bleeding Love song with my latin Partner Onn Rei.I will be representing for The One Academy. The winning is based on 50% on Judging and 50% on Audience Vote.Any of you reader are interested in this only RM25 per person for the whole event.In the afternoon there is workshop on Latin,Malay dance and Hiphop .About the night event is the competition. Come along with your friends support me and vote for me so i could stand a CHANCE to win the competition. This year, HELP Dance Club will be organizing a dance workshop and dance competition. 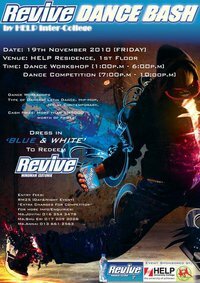 Sponsored by Revive, it is guaranteed to be a fun filled; challenging and eye-opening event. Divided into a day/night event, you would be able to learn and experience different dances and watch dancers compete in their best dance. For one price of RM25, you could learn Latin Dance, Malay Contemporary/Cultural dance and Hip Hop from experienced dances/teachers. Not only that, you would be invited to watch the dance competition which will be held at night. For dancers who wish to compete, fret not. This dance bash has also included dance competition for different type of dances to accommodate everyone. The competition is divided into 2 groups : individual/couple and team. For individual and couple group, both participants have to be college or university students. Where else, for the team group, at least 1 participant has to be from college or university. Entry fee varies with groups. There are lucrative prices to be won!! So dancers, don't miss this chance to win them.